There once was a time when small trim saws were sought after tools, but it seems as though they died off as people moved to bigger (better?) saws. Well, Makita is bringing the compact trim saw back; this time in a 12V lithium-ion form. So why are trim saws so great anyways? It is as simple as size and weight. With the new Makita SH01W 12V cordless saw you only get a maximum cutting depth of 1-inch at 90-degrees, and 5/8-inch at 45-degrees, but when you are cutting sheets goods, this is plenty. Of course you can also cut drywall, pegboard, particleboard, and much more. At a weight of only 3.3 lbs you can keep this in your toolbox and always be ready in case a cutting need appears. Makita says the saw can make approximately 70 cuts of 1/2" x 12" plywood at 90-degrees (basically 70-feet). This is obviously not enough for production work, but seems ideal for maintenance workers, cabinet installers, and other people with light duty cutting needs. 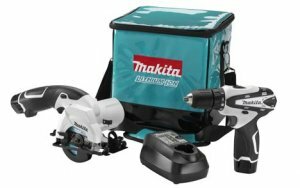 I mentioned that the saw can be purchased as a combo kit, so also included is the Makita 12V cordless drill-driver (FD02W). This little drill uses a Makita-built motor that provides up to 200 inch-pounds of torque, with two variable speed settings (0-350/0-1300 RPM), and 18 clutch setting for your driving needs. Like most Makita tools it also features a LED surface light. The FD02W weighs in at 2.2 pounds and is only 7-7/16" long. The combo kit (LCT208W) can be purchased now for around $200, and includes the 3-3/8" saw, 3/8" drill-driver, one battery charger, and two 12V lithium-ion batteries. Also included is a tool holster, a 20 tooth carbide tipped blade, #2 Phillips bit, and a contractor storage bag.